A Klingon fleet is in our solar system, ready to attack Earth. We hear a voiceover from Michael Burnham (Sonequa Martin-Green). “On the eve of battle, on a cold and windless night, an old general turned to a young soldier. ‘Tomorrow,’ said the master, ‘you will know Fear.’ The young soldier who had not yet experienced the agony of war looked at the general with quizzical eyes. ‘How will I know Fear if I do not know what it looks like?’ The general replied, ‘You will know Fear because it speaks very fast and it speaks very loud…’ ‘If that is how Fear acts, recognizing it is easy.’ But as the young soldier considered the general’s advice, she asked the question facing us now, ‘Once I know Fear, how do I defeat it?’” Emperor Philippa Georgiou pretending to be Captain Philippa Georgiou (Michelle Yeoh) isn’t doing a good job; she is acting both weird and harsh to the crew. A crewmember tells her the Discovery is approaching the Klingon home world. “Klingons are animals, and they don’t have homes,” responds Georgiou. Bryce (Ronnie Rowe): “Discovery is running dark, Captain.” Emperor Georgiou: “My favorite way to run.” Both Burnham and Commander Saru (Doug Jones) give her the side eye. Saru calls for Burnham so they can talk about her, but Georgiou calls Burnham back to her post once they start talking. Emperor Georgiou: “What’s wrong? Are you scared, Number One? Where I’m from, there’s a saying, ‘Scared Kelpian makes for tough Kelpian.’ Have you gotten tough since we served together on the Shenzhou, Mr. Saru?” Saru: “Affirmative, Captain. Very tough. So much so that many find me simply unpalatable.” Burnham asks to speak to the ‘Captain’ in private. In the hallway, they exchange words. Burnham wonders how desperate does the Federation have to be to place the Emperor in command. Emperor Georgiou: “And what’s so bad about desperation?” Georgiou informs Burnham she read about her mutiny against her Georgiou, “You know your problem? No follow-through.” She tells Burnham that if she had killed Captain Georgiou, her mutiny would have worked. She asks if Burnham is going to give her any trouble, Burnham says she won’t. Georgiou decides she needs additional information on Qo’nos, so she and Burnham head to the Brig to interrogate L’Rell (Mary Chieffo). The Emperor’s interrogation technique is to beat the crap out of L’Rell. She won’t give them any information. After the beating, Burnham remembers that they can probably get the same information from Lt. Ash Tyler (Shazad Latif). Tyler is in his quarters tying knots as he did as a youth to remind himself of his humanity. Georgiou calls Tyler a half-breed, who is of no use to anyone. He turns to Burnham and reminds them that he can access the memories of Voq. He tells her he will help them [pausing for a moment to make us think he’ll say for her] for Starfleet. Tyler explains the layout of Qo’nos, and that their best bet is to go to an Orion outpost on Qo’nos. There is a shrine there. [I think it has an opening to an inactive volcano that they can send the drone through.] Georgiou tells them she is going to send a drone to map the best places for Starfleet to attack. Tyler tells them there are shields around it, so they will have to send a landing party. Georgiou decides she’ll lead it and picks Burnham, Tyler, and Cadet Sylvia Tilly (Mary Wiseman). Tilly is excited to meet Captain Georgiou in person since Burnham has said so many great things about her. After Georgiou tells her about the good times she and ‘Killy’ had ravaging planets, she realizes this isn’t our Georgiou. Georgiou fingers her curls and says, “These are hideous, of course.” Lt. Paul Stamets (Anthony Rapp) is able to jump the Discovery into Qo’nos. After Tilly straightens her hair, the landing party beams into the Orion outpost. The Orion outpost is a sleazy rundown place. Georgiou has brought some of the weapons Terran Lorca had aboard the ship to sell for cash to buy information on the location of the shrine. She tells the landing party, “We’re not here for bread and circuses,” Georgiou spots a brothel, before concluding, “On second thought; the circus is where we’ll start.” She sends Tyler and Burnham to buy information, she orders Tilly to come with her and guard the drone that is in a briefcase. The brothel has a male and female dancing for the customers. Emperor Georgiou: “I knew your whole universe couldn’t be boring.” Georgiou goes up to the dancers and asks, “How much for a little ME time?” Tyler leaves Burnham to gamble with some Klingons to gain some information. Their laughter visibly upsets her. A shady Orion (Clint Howard) offers Tilly some gas, she initially refuses but they are going to throw her out if she doesn’t participate. She inhales some and passes out. Tyler rejoins Burnham and she tells him that the Klingon laughter reminded her of the day the Klingons killed her parents. Tyler tells her he can understand why she hates Klingons and him. She tells him if it was only that simple. She looks around this dump and says that she is worried that once the drone maps the place for the strategic strikes, it will alter even the lives here. After banging both dancers, Georgiou attacks them to find where the shrine is. Tilly wakes up just as Orion Clint Howard is about the cut the chained briefcase off her wrist. She finds out from him that the volcanoes are still active. Tilly opens the briefcase and discovers there isn’t a drone in the briefcase but a Hydro bomb. Tilly confronts Georgiou and she punches her, briefly knocking her out again. Tilly uses her communicator to contact Burnham and says, “I’m very high.” She tells her about the bomb. They theorize that if the Hydro bomb is dropped in the active volcano, it will destroy Qo’nos. They contact Saru; he tells them it is too late to stop Georgiou. Burnham figures out that Georgiou is operating under Starfleet orders. She asks to talk to Cornwell. Back aboard the Discovery, Burnham confronts Admiral Cornwell’s (Jayne Brook) holograph. “A year ago, I stood alone. I believed that our survival was more important than our principles. I was wrong. Do we need a mutiny today to prove who we are?” The crew proudly listens to Burnham defend Starfleet principles. Cornwell: “We do not have the luxury of principles.” Burnham fires back: “That’s all we have, Admiral!” Saru stands along with the rest of the crew and says that we are Starfleet. Burnham and the crew’s stand persuades Cornwell and she asks what they should do. In the temple where Georgiou has dropped the bomb in the volcano, Burnham talks to the Emperor. Burnham tells her the deal still stands; she can still have her freedom if she deactivates the bomb. Georgiou still wants to activate the bomb and asks Burnham to join her. They can use the bomb to gain advantage over both the Klingons and Federation. Burnham refuses, “The only way you’re going to get past me is to kill me.” Not only will she have to kill her, but also she’ll have Starfleet after her. She counts on Georgiou not wanting to ‘see her die again’, and she bets correctly because Georgiou is willing not to detonate the bomb. She asks does Starfleet want it, but Burnham has another idea. The ship beams L’Rell and Tyler into the room. Burnham tells her about the bomb; L’Rell asks if Burnham had her brought here to gloat. She tells her, she will transfer the bomb to her so she can unify the Klingon houses. L’Rell doesn’t think she is the person for the job but Tyler/Voq tells her to step out of the shadows and lead. Georgiou prepares to leave and Burnham says to her, “Be good, Philippa.” Emperor Philippa Georgiou smiles at her, probably because she has no plans to do so. Tyler and Burnham go outside where he tells her he is going with L’Rell to help bring about peace. “I will miss looking at your face,” an emotional Tyler tells Burnham. She responds looking into his eyes, “I see you.” They kiss. L’Rell speaks to the leaders of the Klingon houses and tells them she is going to take over and reunify the houses. They laugh at her until she shows them the detonator to the Hydro bomb in Qo’nos. Soon after the Klingon fleet leaves our solar system. The Federation celebrates; the war is over. Burnham meets her parents, Amanda (Mia Kirshner) and Sarek (James Frain) in Paris outside Federation headquarters. She tells Amanda that when she was a child, Amada would tell her to see the value in her humanity; she tells her mom that she sees it now and thanks her. Sarek gives her the good news, the Federation expunged her record, the Federation President gave her a full pardon and her rank is restored to Commander. He thanks her for what she did, because he made the mistake of agreeing with the plan to destroy Qo’nos and is glad she prevented it from happening. She understands why he did it and doesn’t hold it against him. Inside headquarters, a ceremony for the Discovery crew proceeds. Saru and other members of the crew are awarded medals while Tilly finds out that Starfleet approved her entrance into the command-training program. Burnham is giving a speech and she is saying the voice over we heard at the beginning of the episode. She continues, “The only way to defeat fear is to tell it ‘No’. No, we will not take shortcuts on the path to righteousness. No, we will not break the rules that protect us from our basest instincts. No, we will not allow desperation to destroy moral authority… We have to be torch-bearers, casting the light so that we may see our path to lasting peace.” After the ceremony, the Discovery will drop Sarek off at Vulcan while they pick up their new captain. They receive a distress signal; the distress call comes from Captain Pike of the U.S.S. Enterprise. I’m not too sure how bright the Discovery crew is, because no one seemed to suspect something was wrong, even with ‘Captain’ Georgiou’s weird behavior. After serving under one Terran captain, you’d think everyone would be sensitive to how another captain acts. Oh well! Georgiou beats up L’Rell in her cell for info; only then does Burnham remember that Tyler can probably provide it. No one taught Tilly not to do drugs with someone who looks like Clint Howard. Where’s Nancy Reagan when you need her. Starfleet higher ups aren’t much better; Cornwell gave Georgiou command of the Discovery and goes along with her plan to commit genocide. Once the Discovery crew confronts her and tells her this is against Federation principles, she quickly agrees and changes her mind. Sarek was in on it too, not very logical Sarek. I’m not too sure about the Klingons either, they can easily destroy the Federation, but L’Rell threatens to blow up Qo’nos and they quickly turn tail and go back home. It didn’t make sense to give L’Rell the bomb in the first place, it’s not as if she is a pacifist, and you would think one of the houses would call her bluff. This episode didn’t make any damn sense. The writers wanted to tie up the season with a pretty bow and took every shortcut they could to achieve it. They even brought in the Enterprise at the end to make sure we all come back for next season. I didn’t hate the episode; a certain Terran Emperor gave the episode its bright spots. Her little arguments with Saru and Burnham were funny. She strolled in that brothel as the complete boss she is. The smile she gave Burnham when she asks her to be good was priceless. 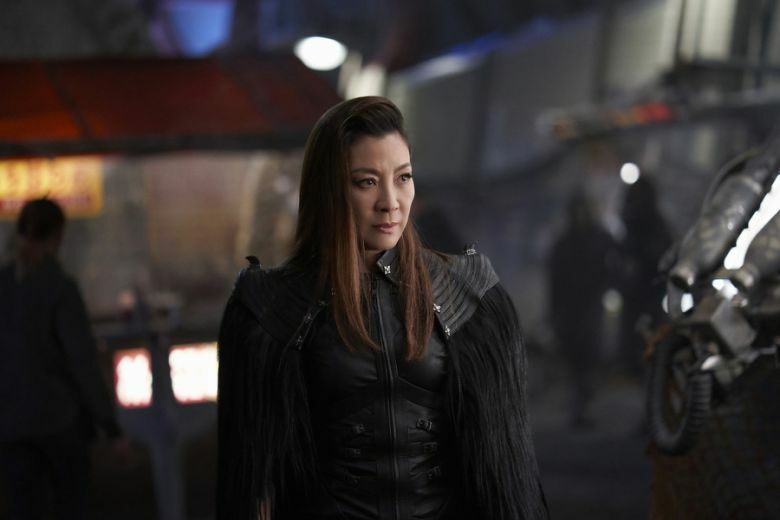 Instead of the Enterprise, bring back Michelle Yeoh as much as possible next season. As good as she was as Captain Georgiou, she was better as Emperor Georgiou. She along with Tilly gave a silly and listless episode some life. I wish she gave Burnham’s speech at the ceremony. At least it would have been funny. Burnham’s speech reminded me of a commencement address by the class valedictorian at her high school graduation. It was so cheesy; Burnham deserved the pardon, her restored rank, and clean record, but now she’s the conscience of the Federation. How did the Klingons’ not win this war? Other Star Trek shows had rough first seasons, and compared to some of those, Star Trek: Discovery’s first season wasn’t too bad. Because of the high TV production values, the show looks great. The cast is good, here’s an idea, use the entire cast more. I like some of the things the writers were trying to do; unfortunately, they fell short most of the time. They wanted to go their own path, but were afraid to wander too far from the template. I hope that with a season under their belt, that they know where they are taking this show. The first two episodes of the season were an epilogue for the season; I think this season was an epilogue for the series. I hope we see what this series actually is next season.